The pattern is 4 pages and written in English. Beep Beep...here is Beeper the Robot! Now if I could just program him to do my laundry! 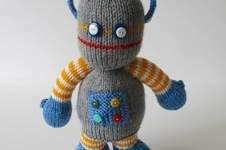 He is a great toy for boys, and you can knit your own robot chum with this knitting pattern. TECHNIQUES: All pieces are knitted flat (back and forth) on a pair of straight knitting needles, apart from the antennae/ears which are i-cord pieces worked on two 3.75mm double pointed needles. You will need to cast on and off, knit, purl, work increases and decreases, knit stripes (change colour at the end of a row), knit i-cord and sew seams. FINISHED SIZE: The robot is approximately 25cm tall.